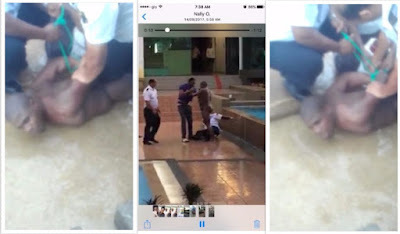 In an effort to be rich, a Nigeria man identified as Ikenna has gone heavily mad in Malaysia, An ebiwalismoment.com reader also his friend who sent in the photos and videos said they were all sitting at a Hotel bar in Punchong Province, Malaysia when he suddenly stood up, stripped completely Unclad and jumped into the swimming pool. Security operatives at the Hotel rushed out and tied him up, In the video he could be seen struggling with them and shouting. 'I am a murderer, tie me, tie me, i kill people, am a black man, kill me oh, kill me oh.. He also mentioned a man named ''Jerfrey''. Sources also gathered that this is his first trip to Malaysia, he's been there for only 3months, before he went exclusively mad yesterday, September 14th. His friend who begged me to keep him anonymous, said Ikenna had always boasted that he will never return to Nigeria the same way he left, that he must return with money at all cost..
Obviously whatever he had involved his hands in has casted, and his suffering.. so sad..
Hmmmm.what shall it profit a man..